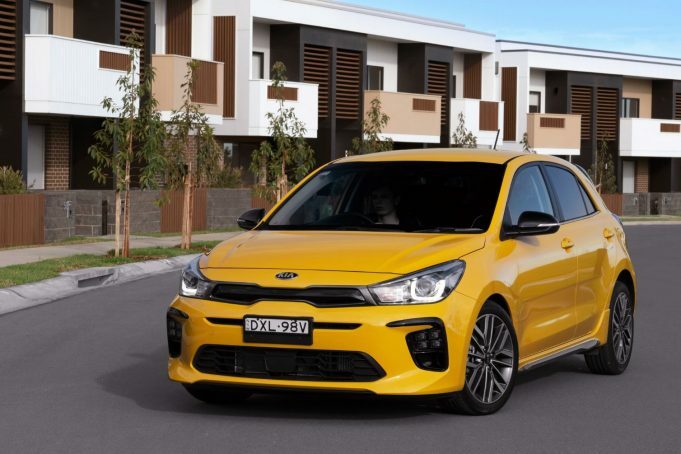 WITH all the excitement of the Carnavale, Kia’s little Rio has been revitalised to meet the demands of a market that’s becoming ever-more sophisticated, with the pint sized hatch undergoing a model re-positioning. The changes include new drive trains and two new trim levels, with the Si and SLi models sent to the scrap heap along the way, making way for the new Sport level trim and range topping GT-Line. The Sport gets a new 6-speed automatic in place of the previous 4-speed box and the GT-Line comes with a goody-bag of special features, led by the perky 1.0-litre turbo coupled to Kia’s in-house 7-speed dual clutch transmission. The new Rio range starts with an unchanged entry level S model with the 74kW 1.4-litre petrol engine coupled to either a 6-speed manual or 4-speed automatic. Standard features on the S include ABS, ESC and VSM (vehicle stability management). It also gets reverse parking sensors, rear-view camera, three child restraint points (two ISOFIX), six airbags, and a six-speaker sound system with Bluetooth, Apple Carplay and Android Auto compatibility. At the top of the range, the GT-Line highlights that 3-cylinder 1.0-litre turbo with a punchy 88kW of power and 172Nm of torque, while significant application has also been given to a specific sport tune for the GT-Line. In a first for the Rio, the GT-Line also comes standard with AEB and Lane Keep Assist as well as Idle Stop and Go, along with a GT-Line body kit, LED Daytime Running Lights, LED Position Lamps, LED rear combination lamps and LED fog lamps. Pricing for the S variant starts at $16,990 drive away for the manual and $17,490 drive away for the automatic. The Sport trim starts at $17,990 drive away for the manual and $18,990 for the 6-speed automatic. The GT-Line is $21,990 drive away.